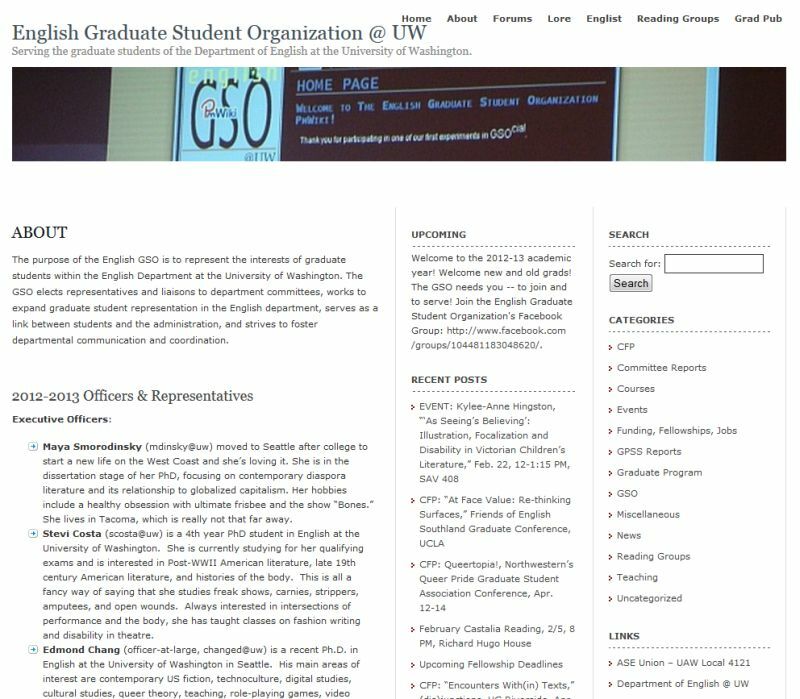 In addition to my research and teaching in digital media, I have also designed and maintain and contribute content to websites for several projects, programs, and courses at the University of Washington. I have proficiency in HTML and experience working with WordPress installations. 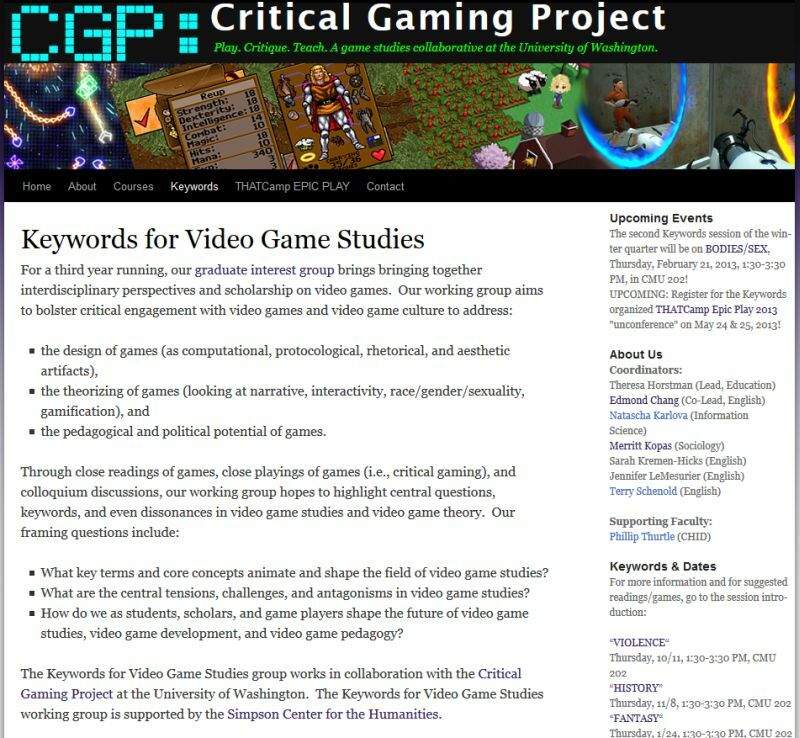 I was an organizer, contributor, and webmaster for the Critical Gaming Project at UW from 2008-2012 and for the Keywords for Video Game Studies graduate interest group, which is hosted by the CGP, from 2011-2013. 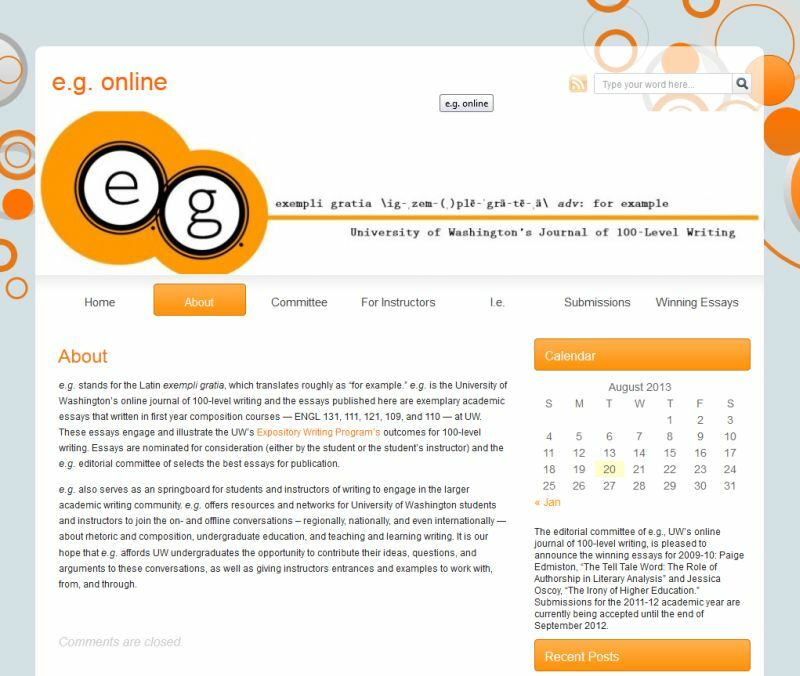 Since 2007, I have been a member of the editorial committee of e.g., the UW’s online journal of 100-level writing. The original e.g. website was simple, functional, and hand-coded by past-organizers. It was also housed on the English department’s server, which unfortunately included access to every other departmental website (a security risk). As the years passed and the number of winning essays that needed archiving increased, the website became unwielding and difficult keep up to date. Therefore, in early 2010, I transferred all of the existing e.g. 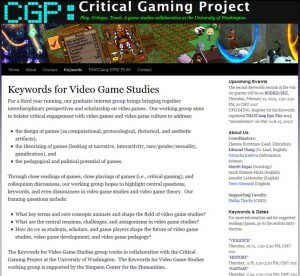 material to a WordPress format, which allowed for easy updating, searchability, as well as the addition of content from the editorial committee. We also moved the website to its own webspace. I served as webmaster for the online journal from 2007-2012. 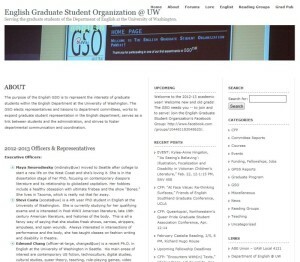 Since 2005, I have been a member of the English Graduate Student Organization (GSO). Initially, as part of my duties, I assisted in the maintenance of the GSO website and wiki. Then, in 2007, I became one of the executive offers and implemented a redesign of the group’s website. The wiki, which was designed to be a storehouse of departmental and graduate program lore, did not attract enough usage. Therefore, I worked with the group to transfer all of the information to a WordPress installation hoping to repurpose and rebrand the website as more of a discussion space and news source. The revised website includes information on program requirements, orientation material for new students, calls-for-papers, reports from departmental committees, and other relevant material. I served as webmaster for the GSO website from 2007-2012 and a moderator for the Englist listserv from 2006-2013. 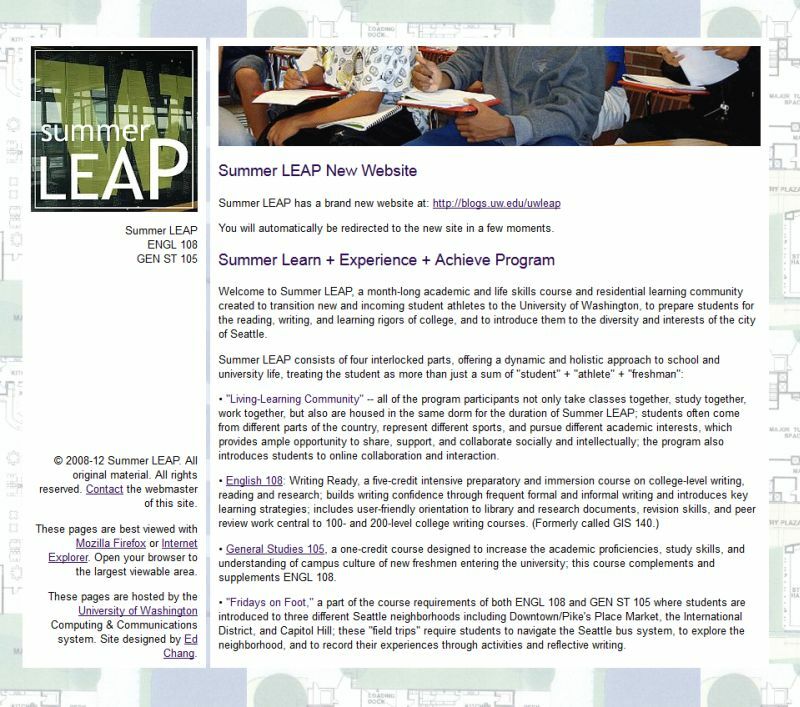 The Summer LEAP program is a month-long academic and life skills course and residential learning community created to transition new and incoming student athletes to the University of Washington, to prepare students for the reading, writing, and learning rigors of college, and to introduce them to the diversity and interests of the city of Seattle. Summer LEAP consists of four interlocked parts, offering a dynamic and holistic approach to school and university life, treating the student as more than just a sum of “student” + “athlete” + “freshman.” Since 2008, I have been an instructor for the Summer LEAP program as well as their webmaster. Recently, the program has won the National Association of Academic Advisors for Athletics 2010 Model Practices Award. I designed and maintained the initial website, then transferred the content to a WordPress from 2008-2012.